Nature Trails @ Devil's bridge Waterfalls at Devil's Bridge Waterfalls & Nature Trail01970 890233work Nature TrailChoose between the 45 minute walk to see the waterfalls and three bridges or the ten minute walk to see the punchbowl and the three bridges. The long Nature Trail to see the Three Bridges and the Waterfalls - Take a walk along the Nature trail and see the spectacular 300ft waterfalls and the view of the 3 bridges, built one on top of the other, which span the breathtaking woodland gorge. Follow in the footsteps of the monks of past, along the path and descend Jacobs Ladder (100 steps). Cross the humped bridge spanning over the Mynach river at the bottom of the waterfalls and begin to ascend the other side of the gorge. Go into Robbers Cave, an old hideout place next to the waterfall. On the walk you will find a free viewing telescope, decking and gazebo with seating. Information boards with local history, u-turn boxes with the legend and history of Devil's Bridge and clips of Welsh harp music. Please note that this is a challenging walk and sensible shoes must be worn. The walk contains many steep steps and so is not suitable for everyone. Alternatively, you can choose the easier, short walk to view the Three Bridges and the Devil's Punchbowl. Descend down to the river to view the punchbowl. Here you can see how the force of the river Mynach has carved beautiful, large pot holes into the rock. From this view point the Three Bridges built one on top of the other tower overhead and are an awesome sight. Use the U-turn box to listen to the story of the ledgend of how an old lady outwitted the Devil to save her cow. 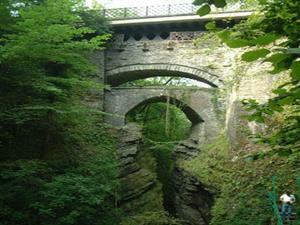 Which is how Devils Bridge got it's name. Hear some traditional Welsh harp music or select the information about the history of our area. Choose between the 45 minute walk to see the waterfalls and three bridges or the ten minute walk to see the punchbowl and the three bridges. These walks are challenging and consists of many steep steps. Free car park. Gift shop, light refreshments and W.C only available during main season. The walk is Not suitable for wheel chairs or pushchairs or people suffering from health problems due to many steep, uneven steps. (please note - attendant hours may vary slightly depending on high or low season). Groups welcome during attendant hours. Devils bridge waterfalls are located on the A4120 (Aberystwyth - Ponterwyd) road. It is in close proximity to the A44 (from the east) and the A487 coast road at Aberystwyth. The nearest Mainline railway station is at Aberystwyth, however the Vale of Rheidol narrow gauge railway terminates in Devils Bridge.